Mother of the redeemed as well. I come to you today as your loving child. upon you, Mother of Perpetual Help. "Make Our Mother of Perpetual Help Known Throughout the World." From the Redemptorists prayer card. My family and I were not able to attend the Bella movie and dinner fund raising hosted by a local prolife group. Happily, we found that the movie was going to be shown at the same theater where the fundraiser was held, for a very limited time. Yesterday afternoon, we jumped at the chance. There was only three of our friends there when we arrived. I sat there and prayed that others would show up to support a prolife movie of such quality! God answered my prayers. For a late Friday afternoon, the theater was well filled. Other than glancing at reviews of the movie, I tried to avoid reading any reviews or commentaries because I did not want to be disappointed by the hype. From beginning to end, the movie captured my attention and my heart. It was a very well done movie considering it was what most of Hollywood would consider low-budget. 2. It was pro life. 4. It was about traditional family values. 5. It was about adoption. 6. It was about the NYC/NJ area. All of the above things are dear to my heart. The only problem I had with the movie and which most of you only English speakers will not even be aware of, is the constant use of one particular curse word in Spanish. It was just so unnecessary. I wonder if it was given the PG-13 rating because of that word usage. It made me bristle every time I heard it. Lastly, and BTW, The choice of the main actors had to be divinely inspired. 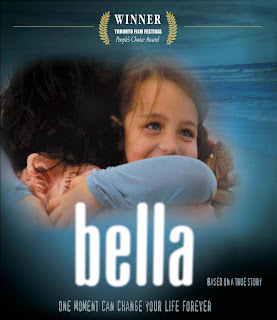 Hawaii, here is your chance to watch Bella. It is only here for a very limited time. It is being shown at the Regal Theaters (Dole Cannery). Please support this movie by taking your friends and family. (Click here for Dole movie listings)or visit Movie Tickets. I saw an interview with Eduardo Verastegui the lead actor and (also producer of the movie) on the O'Reilly Factor yesterday. 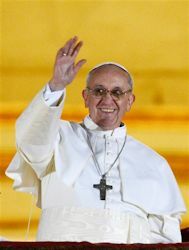 He stressed that ticket sales this weekend will be very critical to the successful of this pro-life/family movie. Please make an extra effort to go. You won't be sorry. Also, if you do go, remember to thank Regal Theaters for bringing another good and decent movie to us. If you recall, they also showed Therese and the Nativity Story. 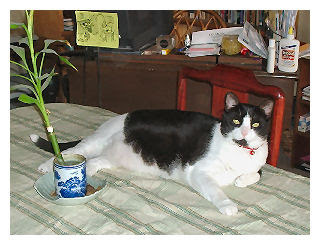 Our cat. I tell my boys, she can do whatever she wants...she's beautiful. A well-worn one dollar bill and a similarly distressed twenty dollar bill arrived at a Federal Reserve Bank to be retired. As they moved along the conveyor belt to be burned, they struck up a conversation. The twenty dollar bill reminisced about its travels all over the country. This reminded me so much of Archbishop Fulton Sheen who spoke up again and again against communism. 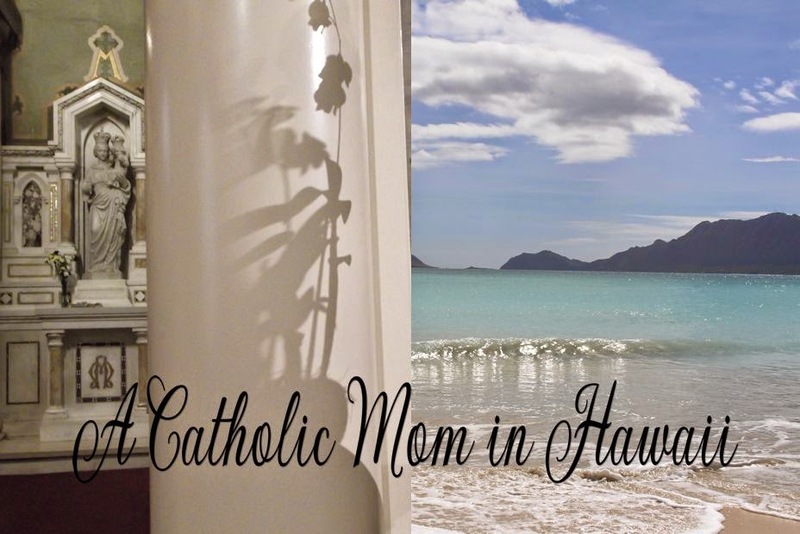 Mahalo to John for sharing. In the midst of his story he looked at the professor and asked a strange question. He asked, "Do you know how to catch wild pigs?" "You catch wild pigs by finding a suitable place in the woods and putting corn on the ground. The pigs find it and begin to come every day to eat the free corn. When they are used to coming every day, you put a fence down one side of the place where they are used to coming. When they get used to the fence, they begin to eat the corn again and you put up another side of the fence. They get used to that and start to eat again. You continue until you have all four sides of the fence up with a gate in the last side. When the pigs (who are used to the free corn) come through the gate to eat, you slam the gate on them and catch the whole herd. The young man then told the professor that is exactly what he sees happening to America. The government keeps pushing us toward Communism/Socialism and keeps spreading the free corn out in the form of programs such as supplemental income, tax credit for unearned income, tobacco subsidies, dairy subsidies, payments not to plant crops (CRP), welfare, medicine, drugs, etc. while we continually lose our freedoms - just a little at a time. H/T to Fr. Daren a teacher who respects the choice to homeschool. Reminder to PRAY THE ROSARY DAILY! I picked up a little pamphlet entitled "The Redeeming Power of the Mass". The following excerpt really spoke volumes to me, me a person who is not a big fan of novenas because I don't think my prayers have ever been answered by them...at least not yet. I hope it speaks to you too. "How often have I head young ladies say to me: 'Father, we are making novena after novena for certain conversions, but to no avail.' Do you know what I reply? I do not blame that: That is all right, but instead of annoying the saints with novena after novena, why do you not make a novena of Masses? THAT IS THE GREAT NOVENA. After all the saints will applaud you, for they realize the greatness of Holy Mass. 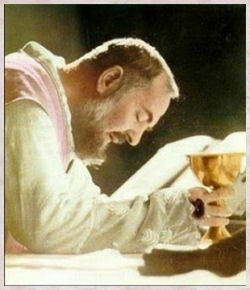 I do not blame your novenas to the saints but I say, transform your novenas into something divine, omnipotent...the Chalice...one more Mass...two...three or four more Masses..if possible, daily Mass. You are asking for a miracle; I approve. But I tell you that you must pay the ransom for the conversions you make. You have a right to ask for such miracles. Do you know what a conversion is? It is the resurrection of a soul. It is far greater to see the resurrection of a soul than the resurrection of a corpse. Oh, one more Mass! Please..one more Mass! Pay the ransom with the Chalice. One more Mass! If you have anyone at home sick or dying, oh pay the ransom with the Chalice..one more Mass!" Please help yourselves to the following Santa Claus blinkies which my friend Layla has shared. I like the fact that so many blogs are promoting the true meaning of Christmas this year. In other words, they do not want to contribute to the commercialism of Christ's birth day. Instead, many folks will be giving homemade gifts this year. My brothers, sisters and I will also be doing something special for Christmas. We all mutually agreed not to spend so much money on buying gifts for one another. Instead, we have send old family videos to our one brother. He is going to create a DVD of a collection of family videos for each one of us. Another sister has collected old family photos. She wanted to have a photo album ready for our Dad's 80th birthday on Monday. But she didn't have sufficient time to get it ready. So, instead each one of us will be receiving a copy of the album. We also need to remember the homeless, the elderly, the lonely, the homebound and all those less fortunate than us. There are so many ways to help make their Christmas a little more brighter. I hope we do more than our share this year. One way we start the Christmas season is on Thanksgiving. One of my good friends signs my family up to help deliver meals with the Meals on Wheels program. It is always touching and also heartbreaking to see those elderly people who grateful for a little meal and a little human contact. So, there are some ideas that our family will doing. Let's really get into the spirit of the Christmas Season. After all, we all know that Jesus is the reason for the season. It is an important duty of ours to pray for the dead because although they may have died in grace and in friendship with God, they may still be in need of a last purification in order to enter into the joy of heaven. Prayer for the souls of the dead can be expressed in various ways, including a visit to the cemetery. Going to these sacred places provides an auspicious occasion to reflect on the meaning of earthly life and to nourish, at the same time, hope in the blessed eternity of paradise. 6. It all comes to this, then. We must discover a simple means to obtain from God the grace needed to become holy. It is precisely this I wish to teach you. My contention is that you must first discover Mary if you would obtain this grace from God. 7. Let me explain: (1) Mary alone found grace with God for herself and for every individual person . No patriarch or prophet or any other holy person of the Old Law could manage to find this grace. 8. (2) It was Mary who gave existence and life to the author of all grace, and because of this she is called the "Mother of Grace". 9. (3) God the Father, from whom, as from its essential source, every perfect gift and every grace come down to us , gave her every grace when he gave her his Son. Thus, as St Bernard says, the will of God is manifested to her in Jesus and with Jesus. 10. (4) God chose her to be the treasurer, the administrator and the dispenser of all his graces, so that all his graces and gifts pass through her hands. Such is the power that she has received from him that, according to St Bernardine, she gives the graces of the eternal Father, the virtues of Jesus Christ, and the gifts of the Holy Spirit to whom she wills, as and when she wills, and as much as she wills. 11. (5) As in the natural life a child must have a father and a mother, so in the supernatural life of grace a true child of the Church must have God for his Father and Mary for his mother. If he prides himself on having God for his Father but does not give to Mary the tender affection of a true child, he is an impostor and his father is the devil. 12. (6) Since Mary produced the head of the elect, Jesus Christ, she must also produce the members of that head, that is, all true Christians. A mother does not conceive a head without members, nor members without a head. 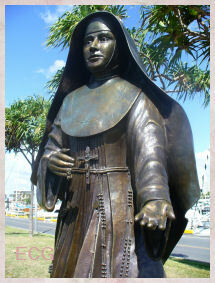 If anyone, then, wishes to become a member of Jesus Christ, and consequently be filled with grace and truth , he must be formed in Mary through the grace of Jesus Christ, which she possesses with a fullness enabling her to communicate it abundantly to true members of Jesus Christ, her true children. 13. 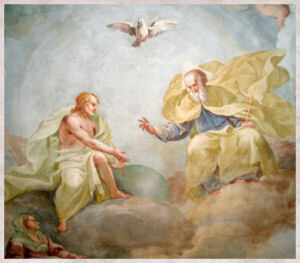 (7) The Holy Spirit espoused Mary and produced his greatest work, the incarnate Word, in her, by her and through her. He has never disowned her and so he continues to produce every day, in a mysterious but very real manner, the souls of the elect in her and through her. 14. 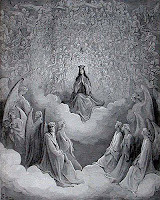 (8) Mary received from God a unique dominion over souls enabling her to nourish them and make them more and more godlike. 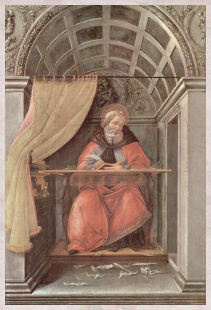 St Augustine went so far as to say that even in this world all the elect are enclosed in the womb of Mary, and that their real birthday is when this good mother brings them forth to eternal life. Consequently, just as an infant draws all its nourishment from its mother, who gives according to its needs, so the elect draw their spiritual nourishment and all their strength from Mary. 15. (9) It was to Mary that God the Father said, "Dwell in Jacob", that is, dwell in my elect who are typified by Jacob. It was to Mary that God the Son said, "My dear Mother, your inheritance is in Israel", that is, in the elect. It was to Mary that the Holy Spirit said,"Place your roots in my elect". Whoever, then, is of the chosen and predestinate will have the Blessed Virgin living within him, and he will let her plant in his very soul the roots of every virtue, but especially deep humility and ardent charity. 16. (10) Mary is called by St Augustine, and is indeed, the "living mould of God" . In her alone the God-man was formed in his human nature without losing any feature of the Godhead. In her alone, by the grace of Jesus Christ, man is made godlike as far as human nature is capable of it. It has slipped my mind what I actually was searching when I came up with the following interview. It must be an old blog post but it was new to me. Usually, a blog post of this length would not keep my attention as riveted word for word. But this one sure did. As soon as I read the words "Jack Chick Tracts" it brought back memories from my childhood of those evil minded cartoons that would tell such horrible lies about the Catholic church. There are a variety of ways to help the Holy Souls. We have listed them in order of effectiveness (i.e. the methods which gain the most grace with the least effort). 5. Purgatorian Society Masses: daily masses said for souls those enrolled. 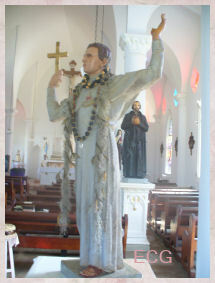 Indulgences are very effective in relieving the Suffering Souls in purgatory. 1) The ironies in my daily life. Today I finally decided to just toss a souvenir we received when the Relics of the Passion tour that made its way to Hawaii. Yes, I fished it out of the trash. This is a good reminder NEVER to toss out anything remotely Catholic. You will regret it. Yuck! "For over a thousand years, the faithful have gone on pilgrimage to venerate the relics of Christ's Passion and Death, and this tour has been designed to make such a pilgrimage possible to the people of the Twenty-first century America..."
2) I have been meaning to post on our modest little relics because I found another one the other day. 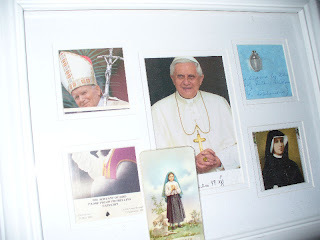 These relics are displayed in a frame along with a portrait of our Holy Father Benedict XVI given by him to Fr. Eugene Palumbo for us and a miraculous medal blessed by our Holy Father at the request of my dear mom through Fr. Palumbo. When I posted on caring for the Altar Linens people left comments requesting information on making altar linens. That is how I found the following online book. It is a complete handbook and should be a valued resource for parish churches, sacristans, altar servers, etc. 2. The sign of the cross if made with holy water. 3. May the Heart of Jesus be loved everywhere. (100 days once a day, Pius IX, Pr. Ma., Sept. 23, 1860). 4. Praised be Jesus Christ forevermore. 5. 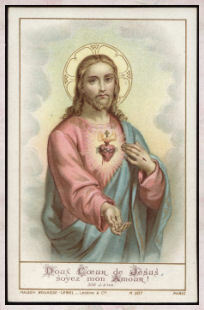 Jesus, meek and humble of heart, make my heart unto Thine. 6. Sweet Heart of my Jesus, make me love Thee ever more and more! 7. Holy, Holy, Holy, Lord God, of Hosts, earth is full of Thy glory, Glory be to the Father, Glory be to the Son, Glory be to the Holy Ghost. 8. Sweet Heart of Jesus, be my love. 9. Sweetest Jesus, be to me not a judge but a Savior. 11. O Jesus, my God, I love Thee above all things. 12. Sweet Heart of Mary, be my salvation! 13. Blessed be the holy and Immaculate Conception of the most blessed Virgin Mary, Mother of God. 14. 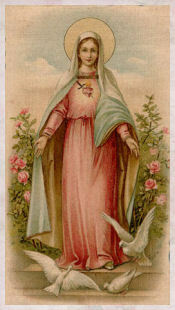 Our Lady of the Sacred Heart, pray for us. 15. 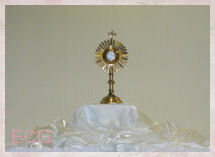 Blessed and praised every moment be the most holy and divine Sacrament. 16. May the Heart of Jesus, in he most Blessed Sacrament, be praised, adored, and loved with grateful affection, at every moment, in all the Tabernacles of the world, even to the end of time. Amen. 17. The Cross is my sure salvation. The Cross I ever adore. The Cross of my Lord with me. The Cross is my refuge. 18. O Mary, who didst enter the world free from stain, do Thou obtain for me from God, that I may pass out of it free from sin. 19. Eternal Father, I offer Thee the Precious Blood of Jesus Christ in satisfaction for my sins, and for the wants of the Holy Church. 20. May the most just, most high, and most adorable will of God be in all things done, praised and magnified for ever. 21. Eternal Father, we offer Thee the Blood, Passion, and Death of Jesus Christ, and the sorrows of the most holy Mary and St. Joseph, in payment for our sins, in suffrage for the holy Saints in Purgatory, for the wants of our holy Mother the Church, and for the conversion of sinners. Amen. 22. 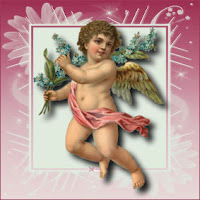 Angel of God, my Guardian dear! to whom His love commits me here, ever this day be at my side, to light and guard, to rule and guide. Amen. 23. My loving Jesus, out of the grateful love I bear Thee and to make reparation for my unfaithfulness to grace, I (INSERT NAME)give Thee my heart, and consecrate myself wholly to Thee; and with Thy help I propose never to sin again. 24. 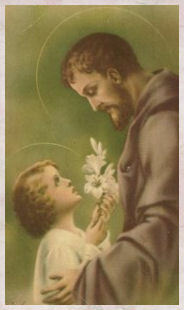 St. Joseph model and patron of those who love the Sacred Heart of Jesus, pray for us. 25. Dear Lord Jesus, grant them (him or her) eternal rest. From Novena for the Relief of the Poor Souls in Purgatory by a Missionary of the Sacred Heart, Rev. J.F. Durin, 1980. How Can We Love Jesus as We Ought? 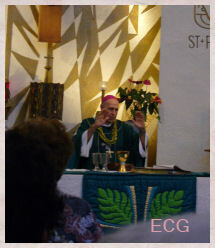 The following is an excerpt from the Nocturnal Adoration Society's February 2006 newsletter. 1. Keep in the state of grace and foster a hatred for all sins and affections for them. If we have the misfortune to fall into any grievous sin make all efforts to go to Confession as soon as possible. St. Alphonsus says that if we entertain any affection for a certain sin, we will fall. 2. 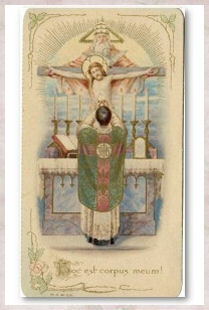 Attend daily Mass and receive Holy Communion. 3. Never omit morning and night prayers. 4. 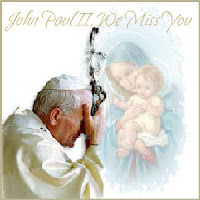 Have recourse to the Blessed Virgin Mary by the daily recitation of the Holy Rosary. 5. Do not neglect the practice of the virtues. In this you will be imitating Our Divine Savior, Jesus Christ. 6. Respond to all holy inspirations to grace and especially those that come to us through the instructions given us in the Holy Scriptures, the writings of the Saints and the teachings of Holy Mother Church. 7. Adjust the priority of your daily schedule to include all we can for the love of Jesus Christ. As I was organizing my bookmarks, I came across a website I had saved. 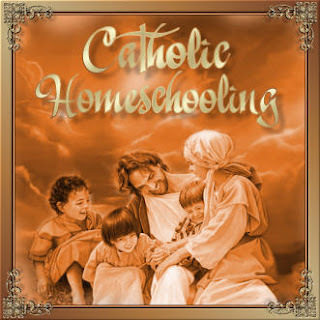 It looks like a lot of fun for Catholic boys and girls. Sir Stephen's Manor Be sure to explore the manor thoroughly. The archived question area is also a lot of fun. How many answers to you know? growing up in an unsteady and confusing world. but as a chance for a new start.